VdS guidelines are particularly practice-oriented and, as a rule, contain classified requirements so that for a very wide area of possible risks and potential damage, damage-prevention measures can be implemented. Objectivity is guaranteed through the participation of experts from insurance companies, the police, the fire brigades, associations of the manufacturers and installers and of VdS. These Guidelines are in accordance with the current state of the art. They do not only specify requirements for CO2 fire extinguishing systems – in the following called CO2 systems – and their components, but also requirements for the buildings and building parts or facilities to be protected. CO2 systems can be expected to operate as intended, only if these requirements are fulfilled. The provisions of the insurance contract are to be observed where claims are brought forward for the approval of an automatic fire detection/alarm system (hereinafter referred to as BMA) by the insurer in the framework of a risk assessment. The installation of a VdS approved BMA, e.g. according to clause 3610, may be contractually agreed. The BMA, in order to be eligible for VdS approval, shall have been planned by a VdS approved installer according to these rules and shall consist of VdS approved components – harmonised in terms of functional interaction – and shall have been installed in compliance with the generally accepted rules of the art. Hence from the technical point of view, the BMA in order to be approved by VdS shall be planned and installed according to these guidelines. The same applies to alterations or extensions of existing systems. These guidelines are based on the fully adopted DIN VDE 0833 standard, Part 2: 2004-02. 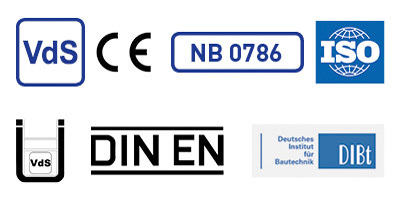 Moreover, the current versions of DIN 14675, DIN VDE 0833 Part 1, DIN VDE 0100, DIN VDE 0800 and EN 54 as well as in general the standards to which reference is made in the text shall be observed for the planning and installation of VdS approved fire detection systems. To be considered for fire detection systems used for the triggering of fire extinguishing systems are also the Rules for Fire Extinguishing Systems. These rules contain minimum requirements for junction boxes in classes A, B and C for use in Intruder and Hold-up Alarm Systems. These rules shall be applied in conjunction with the Rules for intruder alarm systems, general requirements and test methods; VdS 2227 and the Rules for intruder alarm systems, protection against environmental influences, requirements and test methods, VdS 2110. Test methods for junction boxes of classes A, B and C are described in VdS 2166. Note: If junction boxes contain electronic parts (e.g. displays, BUS-coupling devices, processing units) the respective rules are valid for these components. These rules contain minimum requirements for class B and C infrared light beams (ILB) with linear surveillance characteristics or planar surveillance characteristics. These rules shall be applied in conjunction with the Rules for intruder alarm systems, general requirements and test methods; VdS 2227 and the Rules for intruder alarm systems, protection against environmental influences, requirements and test methods, VdS 2110. The Rules for alarm systems, software controlled system components, requirements and test methods, VdS 2203, also apply for system components controlled by software. The test methods for ILB are described in the rules VdS 2485. These Guidelines specify requirements and give recommendations for the design, installation and maintenance of fixed sprinkler systems in buildings and industrial plants, and particular requirements for sprinkler systems which are integral to measures for the protection of life. The requirements and recommendations of these Guidelines are also applicable to any addition, extension, repair, maintenance or other modification to a sprinkler system. It covers the classification of hazards, provision of water supplies, components to be used, installation and testing of the system, maintenance, and the extension of existing systems, and identifies construction details of buildings which are necessary for satisfactory performance of sprinkler systems complying with these Guidelines.